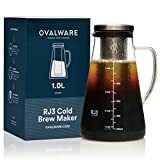 A Professional Brew From The Comfort Of Your Own Home The RJ3 Cold Brew Maker produces a smoother, less acidic brew than conventional hot-water extraction and gives you a stronger concentrate that can be stored in the refrigerator. You can dilute the mix with hot or cold water which means it's superlative for serving guests with different taste preferences. You Don't Have To Be A Professional Barista The cold-brew method is simple: you combine ground coffee with water and let the mixture sit for 12 to 24 hours, then dispense the coffee grounds in the filter - it's that simple. Your Brew Is Less Acidic The cold brew method produces coffee with about 33% less acid content than a regular hot brew, so it's much easier on your body and you are left with just the naturally delicious flavors. Better Build Quality Our modern and practical design comes with: no-spillage leak-proof lid, easy access handle for smooth pouring, a clear measurement label to read the water level and thick borosilicate glass. From A Serious Coffee Company Ovalware is a third wave coffee equipment company and we pride ourselves on consistently delivering a quality brewing and tasting experience. We are on a quest to bring out the best in every bean. We value the simplicity of coffee making and how beautiful it is to manually brew your own cup of coffee No Questions Asked Money-Back Guarantee Your new cold brew maker is backed by a 100% satisfaction guarantee so if you don't absolutely love your cold brew maker, simply return it within 90 days for a full refund. 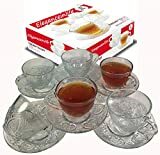 Click add to cart now and get ready to experience a smoother, more flavorful cup of daily coffee! Do you love entertaining? 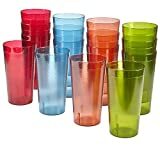 UNIVERSE Double Wall Glasses are the epitome of modern style and simple design, the adept way to wow your guests! 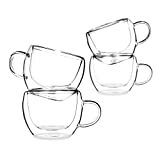 These double walled beauties are easy to use, and effortless to clean! UNIVERSE Double Walled Glasses have an edgy hourglass shape that is comfortable to hold and its sleek design is ultra-functional. UNIVERSE is the adept glassware whether you are entertaining a room full of guests or just enjoying a cuppa yourself; for any beverage of choice, both hot or cold! 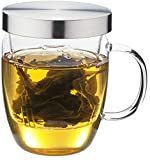 Loose Leaf Tea Infuser Cup From Infinite Tea, the Equilibrium Borosilicate Glass Mug Is a Perfect Tea Maker with Stylish Design, Easy to Use, Easy to Clean, Upgrade Your Tea Drinking Experience Now! Your search for the excellent tea maker is finally over. When you purchase Infinite Tea's Equilibrium Tea Mug today here's what you should do... When that cute little brown box from Amazon arrives at your door, rip it open the first chance you get. 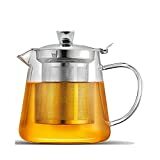 You see before you a 16oz tea mug and infuser made of pure, heat resistant borosilicate glass with a food grade, stainless steel lid. Now open the box, remove the cup from the bubble wrap and hand clean once before use. Grab your esteemed loose leaf tea and place your tea leaves into the infuser. Pour 16oz of water at your choice of temperature into the cup, set the stainless steel lid on top. As you eagerly await your tea to steep, notice how the translucent glass infuser allows you to view your esteemed tea leaves blossom. When your tea is ready, flip over your stainless steel lid and use it as a coaster for the glass infuser. What separates the Equilibrium Tea Mug from the competition? It's simple really. 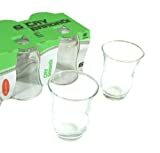 It starts with the borosilicate glass, which is made by adding boric oxide to the traditional glassmaker's frit of silica sand, soda, ground lime. 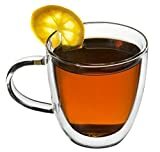 The chemical resistance of borosilicate glass ensures that you are drinking your tea, and only your tea, unlike some plastic drink-ware that can leech chemicals into your hot drink. It's because of this that we're able to make a guarantee unlike any other you've seen for tea brewers. It's our better than money back guarantee and here it is... If at any time within the next year that you are unsatisfied with our Infinite Tea Mug, we'll reimburse your purchase price no questions asked. And you can keep the mug. That's how confident we are that you will love the Equilibrium Tea Mug. So order now and when you do consider getting two... one for you and one for your very best friend. Modern and beautiful tea set. With the infuser and lid in place, you have your own little teapot ! Slots in the glass infuser allow the full flavor of the leaves to seep into the water without getting tea leaves into your drink. When using the infuser, use only enough leaves for one person (approx a tablespoon) which will also allow enough room for the leaves to move around and quickly brew your tea. When the tea is ready, remove the lid and place it upside down so that is now acts as a saucer. Then remove the infuser and place it on the upturned lid.